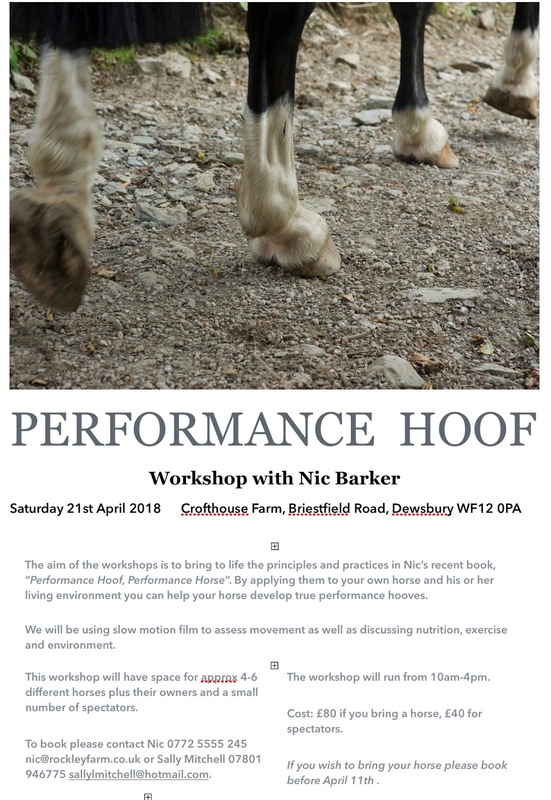 I spent the weekend at the first of the Performance Hoof workshops, in Yorkshire, and it was brilliant to have a day with such dedicated horse owners. We talked about hoof balance, movement and anything and everything to do with horses and their feet and the sun shone on us as we did so! 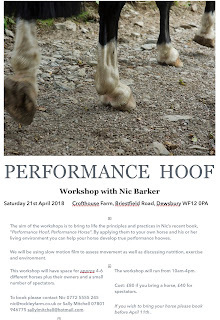 I will post later this week about upcoming workshops, with dates and venues, for anyone who might be interested in coming along. In the meantime on Sunday I managed to get belated footage of Maysie and Mickey, 2 of the rehab horses who have now been here 3 weeks. I'm posting their footage initially as its available and photos aren't (camera trouble, I think it is exhausted after the weekend...!). Its not the most dramatic footage but it is always useful to chart how horses are landing. In both cases they were landing toe first and laterally loading in front. Neither horses has an established heel first landing yet but they are landing flatter than they were and the lateral load has also reduced slightly. Its early days but these are encouraging signs. Jess is the next horse to get an update. As usual her initial photos are the uppers ones and todays photos are the lower ones. She is going to have quite a steep angle change I think as her new hoof capsule grows in - ideal as it will shorten her toes and shift her weight back as her palmar hoof strengthens. You can see from this angle how the back of her foot is changing and the footage below confirms this. A bit too dark/muddy for good comparison but the digital cushion/hairline is looking better today. The shorter toe is already clear from these photos - and there was no trimming required! The change is equally clear from the sole shots, and you can see that the heels are more supportive. Her landing was flat rather than toe first when she arrived but its improved to become more like a heel first landing today. Its update time as the rehab horses who arrived at Easter have now been here for 2 weeks. I'm starting with Vico for no particular reason and will post photos of the others as we go through the week. As always his initial photos are at the top and the current update is the lower photo in each case. For Vico the biggest change so far is that his frogs and palmar hoof are starting to work harder and are loading better than they were when he arrived. This IS the same foot, honestly - I am not sure where his white markings have gone but as he is changing his coat pretty fast at the moment maybe he is losing a few grey hairs! Terrible lighting I am afraid but you should just be able to make out an improving digital cushion and less under-run foot. Looking rather tatty at the moment which is a function of him using the palmar hoof more. It should get prettier over the next few weeks. Mickey is the last of the new arrivals, another who has been diagnosed on MRI with damage to the cartilage of the navicular bone and DDFT. He has quite narrow, boxy feet and like the other new arrivals he has previously been shod and has only recently come out of shoes. Clearly his frogs and heels are contracted but Mickey is quite a tough chap and should be able to bounce back from this. On video he is landing toe first in front, as you would expect with his weak palmar hoof. He is also loading the lateral side of each front foot which typically indicates a medio-lateral imbalance. You can see on the sole shot above how the lateral side of his foot is more developed than the medial side and this is something we would want to see change over the next few weeks. I am combining 2 horses today, something I hardly ever do but just because I am running out of weekdays. First up is Vico, our third arrival, who also came at the weekend. He is a warmblood dressage horse who has had low level lameness for 2 years which has been treated with remedial farriery and cartrophen. He had his shoes removed about 6 weeks ago and has come to us to see if his lameness can be improved. He has not had an MRI but x-rays showed navicular bone damage. He doesn't have bad looking frogs although his feet are relatively flat. He is landing toe first, as would be expected with his diagnosis. This is his more under-run foot and it will be interesting to see how it changes. His initial footage is below, as usual. The second horse to arrive at the weekend was Jess who has been diagnosed on MRI with impar ligament and navicular bursa damage, worse on the right foot. There was no damage associated with her DDFT and her palmar hoof is more robust than we often see. She has a slight heel first landing, which is normally a sign of a reasonably comfortable palmar hoof, but is landing on the lateral side of both feet. Although there was no lameness diagnosed on her left foot it is similar in appearance and landing to the right foot. Her toes are long of course but I expect that to resolve without trimming on the tracks. An update on Jess will follow in a few weeks and her footage is below. After a short break it was a busy Easter weekend welcoming a new group of rehab horses to Rockley. As usual, I will post their photos day by day and the first new arrival is Maysie from Essex. Maysie is a 6 year old and has been diagnosed on MRI as having a medio-lateral imbalance and navicular changes in all 4 feet. Her palmar hooves are under-developed but could be a lot worse. Its always particularly worrying when a young horse has lameness at such an early stage but fortunately her discomfort and poor landing were spotted quickly. This foot looks the worst of the two if anything but as her lameness is relatively mild I hope it will quickly start to improve as her feet strengthen. Maysie is landing toe first, as you might expect, and is also landing on the lateral side of both front feet. We need to see improvement in both these areas over the next few weeks.